Problem, medieval peasants? The PC version of Rock of Ages is coming with a special "Trollface" boulder skin to make up for its late release. While Xbox 360 owners can enjoy Ace Team's utterly mental boulder-rolling, smash-a-thon Rock of Ages right this very moment, PC gamers have to wait until September 7th. This just won't do, I tell you. It won't. How does Ace Team, the developer behind the compelling, but utterly mental Zeno Clash, intend to make up for this terrible slight? 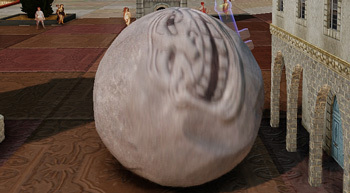 Well, owners of the PC version of Rock of ages will be able to download the game's official soundtrack along with the game when its released, and, best of all, they get an exclusive boulder skin that sports the popular "Trollface" of internet meme fame. Apparently the Rock of Ages community chose the skin, and I must admit, they chose well. The Trollface, or Coolface, as it's sometimes called, is an icon that celebrates the sheer malevolent cruelty internet denizens are capable of. I can't think of a better choice for a giant boulder tasked with crushing a person's house, family and livelihood for our snickering amusement.